The attempted extradition and prosecution of WikiLeaks founder Julian Assange by the United States should be an obvious outrage. It's a very clear effort by the US government to punish those who expose embarrassing secrets about its actions, and it could set a precedent that would threaten journalists everywhere. And yet many of those who should be championing Assange's cause and condemning the prosecution are doing exactly the opposite. Plenty of liberals and mainstream journalists are inexplicably cheering for Assange to be punished. 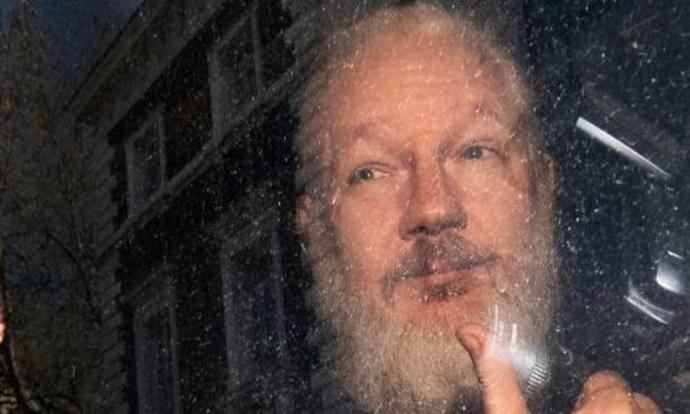 There has been plenty of over-the-top gloating about Assange's arrest. In the Atlantic, Michael Weiss said Assange "got what he deserved". Some Democratic politicians have been salivating at the possibility of prosecuting him. Hillary Clinton said that Assange needs to "answer for what he has done". Charles Schumer said he hoped Assange "will soon be held to account for his meddling in our elections on behalf of Putin and the Russian government". Dianne Feinstein has been calling for Assange to be brought here and prosecuted since 2010. West Virginia Democratic senator Joe Manchin went even further, with the truly disturbing comment that "now [Assange is] our property and we can get the facts and truth from him". Nor did Bernie Sanders speak up to defend Assange, opting for the same shameful silence he has taken on the imprisonment of whistleblower Chelsea Manning. The other 2020 candidates, with the exception of Mike Gravel and Tulsi Gabbard, have also stayed quiet. There's a lot to be disturbed by here. First, it's not clear that people like Schumer even care about the question of whether Assange broke any laws. Assange has been charged over allegedly helping Chelsea Manning to crack a Department of Defense password in 2010. The indictment has nothing to do with Putin or the 2016 election. Yet Democrats are thrilled enough to have a longtime villain in the clasps of the United States government that the actual charges, and their implications for free speech, are irrelevant. Those free speech questions are serious, and nobody inclined to celebrate Assange's arrest should wave them away. The documents WikiLeaks published, obtained by Chelsea Manning, revealed evidence of serious criminal wrongdoing by the United States armed forces. They shined a crucial light on some of our government's ugliest actions abroad. Because the US government does not like to have its secrets exposed, and needs to send a message to anyone who undermines its authority, it needs to prove that its security state has global reach and that even people outside the US will be seized. This prosecution is about silencing dissent rather than enforcing the law. The accusation against Assange is that nearly 10 years ago he tried unsuccessfully to assist in breaking a government password. How often does doing this result in a years-long federal investigation and an extradition request? Or US senators declaring a foreign national the "property" of this country? The Obama administration fished for years to find a charge that would stick to Assange, but ultimately couldn't find a way of going after him that wouldn't also criminalize ordinary acts of journalism. Donald Trump's government is less scrupulous. Some have argued that Assange isn't under attack for "journalism", but for "activism". Frida Ghitis of CNN wrote that Assange "is not a journalist and therefore not entitled to the protections that the law - and democracy - demand for legitimate journalists". This is a dangerous position. Generally, the law doesn't actually distinguish between "journalists" and "non-journalists", giving everyone the same protections. This is for good reason: if such a distinction becomes legally relevant, it means the government is empowered to decide who the True Journalists are. Those of us who work for independent media outlets - I edit a small-circulation political magazine - will always operate under the threat of being deemed "illegitimate" and having our rights taken away. Even if you think Assange is "not a journalist", the precedent his case sets has ramifications for journalists everywhere. And I do mean everywhere: remember, Assange is Australian, so don't be surprised when the US tries to seize any journalist around the world who can be alleged to have violated one of its laws. In defending Assange on this issue, some may be tempted to say "Of course I don't like the guy, but…" I'm not going to say that, because it should be obvious that one's opinion of Assange is completely irrelevant to the issue. Michael Weiss said nobody should fall for Assange's "phony pleas for sympathy, his megalomania, and his promiscuity with the facts". The Washington Post's editorial board said he is "he is long overdue for personal accountability". True or not, these are not the issue. You don't need to know what Weiss, the Post, or I think of Assange's morals. What you need to know is that anyone who doesn't stick up for him against this prosecution is both unprincipled and foolish. Unprincipled, because they don't care about protecting the liberties that are essential to exposing government crimes, and foolish because authoritarianism doesn't come all at once. It creeps slowly, normalizing itself bit by bit, until you don't realize that it's too late. First they came for Assange, and if you say nothing, they're coming for you next.